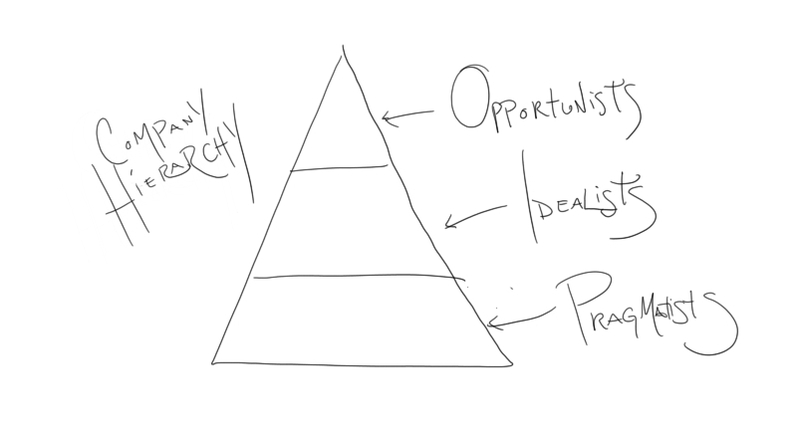 In a post I refer to often, I define the corporate hierarchy and the people who occupy it. There’s a lot of subtlety to the particulars about the archetypes, but I’ll give a really quick overview. Idealists really believe in the company they work for, generally over-performing in the hopes of climbing the ladder. They move up, but in limited fashion. Opportunists have the secret to rapid corporate ascension. Bearing that in mind, let’s look at how each of these archetypes handle the exit interview. Pragmatists view this as the first (and last) time they’ll ever really have any leverage regarding their company and act according to their personalities. Some will be tactful and some checked out. Others will gleefully badmouth the company and attempt to settle scores. Idealists get extremely engrossed in the company narrative in general and will approach the exit interview the way spouses approach a divorce conversation. Lots of emotional feedback and the general operating assumption that their feedback will matter. Opportunists? Well, opportunists do something else altogether. And that’s what I’m encouraging you to do. Opportunists have a game plan for this occasion. Most of them probably hatch the plan subconsciously, without really sitting and preparing in any way. But some might take an overt approach. In either case, they have the same game plan. Pretend that the current job is the second best thing that ever happened to them, second only to the job they’re taking. They might hate the current job. They may also hate their managers, coworkers, and everything else right on down to the coffee in the breakroom. But HR won’t hear anything about that. 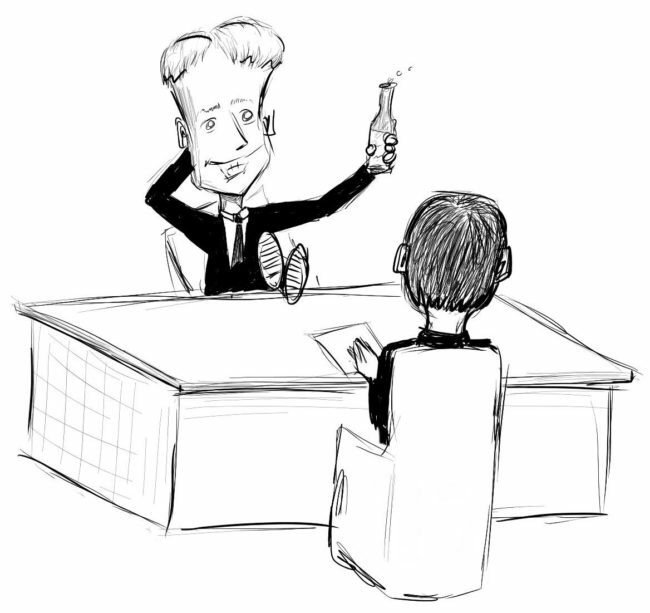 The exit interview will be a highly pleasant and superficial affair. Oh, sure, they’ll concede very minor shortcomings — they won’t want to lay it on too thick and seem insulting. Just cheerily cooperative and superficial. HR: Why are you leaving us? Opportunist: It wasn’t an easy decision, but I just have an opportunity too good to pass up. HR: What was the best part about working here? HR: What didn’t you like about working here? Opportunist: Honestly, everything was pretty great. I guess some of the pockets of overtime dragged on me a bit, but that’s gonna happen anywhere. It’s really hard to think of anything. Why does the the opportunist do this? It’s a pretty simple expected value calculation, reminiscent of a corporate version of Pascal’s wager. There’s really no upside to honesty, as far as the opportunist is concerned. The company consists of a bunch of humans about whom the opportunist is to provide feedback. Provide good feedback and those people will remember the good things said about them. Provide negative feedback and the opposite is true. All of those people will continue to play out their careers, staying at that company or moving on to others. And, at some point, they may be in a position to help the opportunist out in some way. So why not make sure they have every reason to do so? Even people with whom the opportunist vehemently disagreed or had stylistic clashes may relent in retrospect. A problematic manager or coworker might expect negative feedback and be pleasantly surprised (and probably confused) to receive positive. In a subtle sense, the opportunist creates a favor owed. But That’s Not Right — Think of the Company! Let me answer this in two ways. First, pragmatically, and second philosophically. Pragmatically speaking, reverse the roles and imperatives. What HR and others are saying to you is, “you should incur some risk to your career prospects as a favor to the company and to other people.” But would (and did) the company do this for you? You’re leaving for a reason. Did the company take a slight amount of risk to do you the favor of paying you more, giving you better assignments, or whatever prompted you to leave? Nope. More philosophically, opportunists understand the corporate game and they do something the other archetypes don’t. They ignore the idea of “the company” altogether. Pragmatists view the company as sort of a parental figure and idealists view it as a steward of their careers. Opportunists realize that the company and its culture don’t matter and that companies are just complex collections of individual relationships. Viewed through that lens, the honest exit interview is absurd and just amounts to gossiping on the record about potential future business relationships. 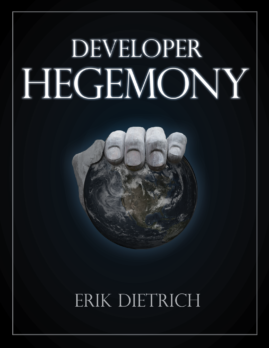 I talk a lot more about these concepts in my book, Developer Hegemony. Embracing the opportunist outlook tends to create crises of ethics in career-minded people. But this particular opportunist play doesn’t expose you to that. It’s a perfectly reasonable thing to do. Do you really think you’re going to tell the HR people anything they haven’t heard and aren’t aware of? Do you really think what you say will translate into actionable… anything? Like the performance review, the exit interview seems a good idea in theory, but it’s really mainly an ignored formality. People go through the motions. You’ve already taken a major step toward looking after your own interest. So don’t stumble on this relatively minor one. Preserve all relationships that you currently have and maximize your future interests. This will put you on the pathway to realizing meaningful organizational authority in your career, rather than pretending at it during extremely temporary moments of leverage. Why not just decline the Exit Interview entirely? I would view declining the interview as a non-verbal statement of – I don’t have anything good to say so I won’t say it at all. You’d rather have them remember you for good reasons as mentioned by Erik’s statement ‘Provide good feedback and those people will remember the good things said about them. Provide negative feedback and the opposite is true’. Try to find something positive to say so you aren’t losing your opportunity to have them on your side at some point in the future. This strikes me as essentially a subset of the pragmatist, temporary leverage play. The message there is “I don’t need to do your stupid process anymore, suckers!” It’s true, but it won’t leave a good taste in anyone’s mouth when they think about you. Exactly what I did on my last and hopefully final exit interview. I will never put anything on GlassDoor either. There is no upside. That’s a great point. I’ve never (despite temptation at times) said anything on Glassdoor. Even on sites like Angie’s List when I feel like maybe other people should know about a contractor, I tend to leave a bad review in my back pocket as a possible leverage/negotiating tool.